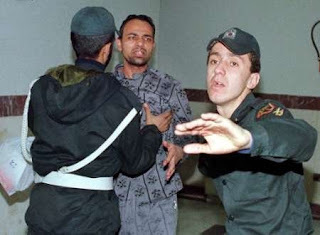 It is not often when a prisoner in Iran is put under pressure to appear on a public confession show but manages to resist all physical and mental tortures and defeats his captors and interrogators. 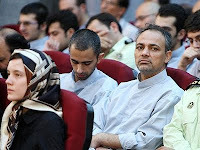 Iranian journalist, Ahmad Zeidabadi is one of those few who can hold their heads up high and join this exclusive club of our national heroes. Zeidabadi suffered 13 months imprisonment back in 2000 charged with incitement of public opinion and actions against national security. During the last elections he worked in Karroubi's campaign team and shortly after the rigged election results he was arrested. During his interrogation period, Zeidabadi was put under all kinds of horrific mental and physical tortures yet he refused to give in. His wife Mahdieh, returning from a rare prison visit said Ahmad was on the verge of committing suicide. His jailors and interrogators unable to extract a confession from him tried to compromise with him and told him to simply apologise. Zeidabadi still refused. Today he received a 6 year sentence. Five years of which will be in a prison far away from his family. He has also been banned for life from any socio-political activities. Effectively Zeidabadi has been banned from writing ever again. Meanwhile Brazil's Leftist President da Silva greeted Ahamdienjad and his 200 man delegation as if nothing inhumane has happened in Iran. there is not much point whining now about the lack of international attention potkin. when you had the chance you should have straight come out against the fascist Islamic Republic and called for its downfall not as you did for support to its so called reformist wing. in time you will remember with shame your posts about the lion of lurestan karroubi ... Iran will become free but it will be down to the sheer bravery of her sons not to muddled up bloggers posting from London. Well it won't be freed by timid Anonymous commenters like you, thats for sure. Long live Karroubi, the 72 year old lionheart. When you have enough courage to come out of the toilet let me know. I completely agree with the comment made by "Anonymous". It is rare to see Mr Potkin out and about at the demonstrations, and the only time he has voiced his opininon is when there is something to gain for himself, namely media coverage. I suggest to him that it is actually he who is in hiding and working towards his own political gain. It is a shame to see so many of our brave young Iranians follow in this cowards footsteps. Potkin sends out his own foot soldiers and he hides behinds the scenes, it is a shame, so I dont think you have the right to insult anyone else for standing back, when you as a self proclaimed leader are not on the front line..